Quite frequently, club members are asked, “What telescope should I buy?” Generally, people who ask us this question are in the market for a beginner’s telescope for themselves or a child. They want to know how much money they should spend, and if the “600 power” model they saw at the local discount store is a good deal. 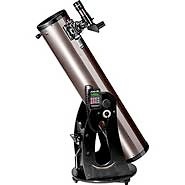 First of all, there are some points to consider before choosing a telescope. Don't be in a hurry. The universe will wait for you! First, start to familiarize yourself with the sky. Using a star map, learn to recognize some constellations, and learn a little bit about different types of objects in the sky (such as galaxies and planets). Be able to recognize and point out various planets if they are visible (such as Venus, Mars, Jupiter, and Saturn). From a dark sky, look for meteors and satellites. You can see a lot with the naked eye. If you have binoculars, use them also. You can see a lot more in the sky with them. Even a pair of inexpensive 10X50 binoculars will show a wealth of objects. Attend a local “star party”. The Fort Worth Astronomical Society in conjunction with the Noble Planetarium staff has free monthly observing sessions at the Fort Worth Museum of Science and History. They are held from March through October (weather permitting). FWAS volunteers usually start setting up their telescopes at dusk. You can come early and watch them set up, if you wish. 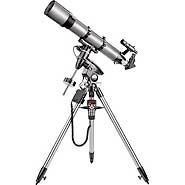 And then, when it gets dark enough, you will be able to look through several different kinds and sizes of telescopes. Anywhere from 30 to as many as several hundred people attend these events. Pick up a couple of astronomy magazines and look through the advertisements. 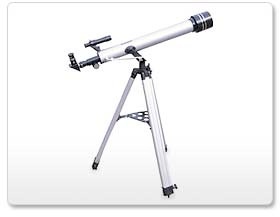 These will show many different types of telescopes available. Two good magazines are “Sky and Telescope” and “Astronomy”. A zero power finder such as a Telrad or Rigel. Pointing a telescope is not a trivial matter. The small finders that come with them are usually not very useful. At least two reasonably good quality eyepieces (a low power 25 mm to 32 mm, and a higher power 8 mm to 12 mm). The Plossl design is very popular and competitive. Meade, Orion, and Celestron offer inexpensive Plossl eyepieces. Some sort of star chart—After looking at the moon and bright planets, finding things in the sky can be a challenge. If you are at all mechanically inclined, you can build your own telescope. It is not too hard, but it does take time and planning. You will not save money over a commercial telescope, but you will have an instrument that works better, provides better images, and is customized for your needs. Some of the tools required include: a radial-arm or table saw, a power screwdriver, a router with a radius arm for cutting circles and curves, an electric drill with bits, and a hole saw. You will be working with fine plywood (such as Baltic Birch) for strength, a cardboard tube meant for pouring concrete pillars (such as a Sonotube), and kitchen counter-top laminate. You will have to purchase a primary and secondary mirror, a focuser, a spider vane, and a mirror holder. If you are truly interested, one of our members will help guide you. It is also possible to make the primary mirror yourself. If you are interested, see our section entitled “Telescope Mirror Making,” which describes the process in some detail.